. 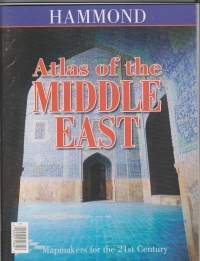 . . Hammond Atlas of the Middle East sheds light on the complex social, political, economic and cultural foundations of the 23 countries that comprise this vitally important part of our world. This comprehensive resource provides a clear perspective and a basis for understanding recent and historical world events. Informative Economic maps of the area depicting agriculture, industry and resources. Thematic maps highlighting petroleum and natural gas sources, population, languages, religion and climate. Informative historical maps on such critical topics as the growth of Islam and Christianity, the rise and fall of the Ottoman Empire and the Middle east since 1945.